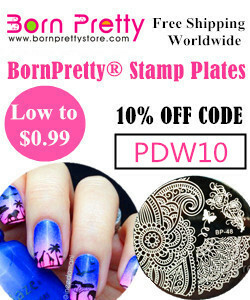 Hi wonderful nail people! Again I'm very sorry I've been rather absent but March was definitely a crazy month! Luckily all the things that were keeping me busy are now over so I've spent today and yesterday doing nothing except painting my nails and it has been fab. To make my return to blogging I have the newest indie box created by the lovely Hayley from Danglefoot Polish. This box was Hollywood themed and we were promised lots of holo. I can safely say that is exactly what we got...plus much more! In this box we got four polishes from four indies and a loose eye shadow from Fairy Pants UK. The first one I'm going to show you is Walk of Fame from Princess Nail Lacquer. 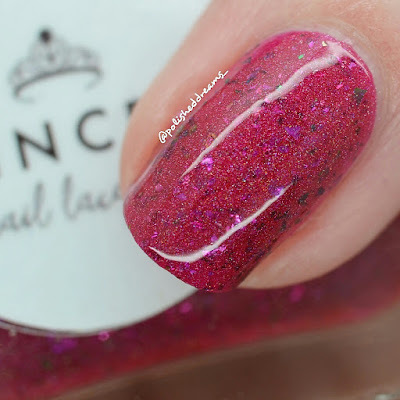 This beauty is a raspberry jelly polish with plenty of gorgeous flakies and holo (obviously). As I was on a course and not at the hospital, I wore this from Tuesday to Friday last week as it went quite well with my work clothes. I was really impressed with how well it lasted on my swatch hand, I only one little chip on my thumb which is very good for me! Cindy didn't fare so well but when does she ever? Despite all the flakies it applied and dried rather smoothly so that's always a bonus. Shown here is two coats and topcoat. The next polish is Rodeo Drive Baby! from Opulent Essences. Shockingly this my first OE polish! A lovely greeny bronze, this is definitely a new shade in my collection. 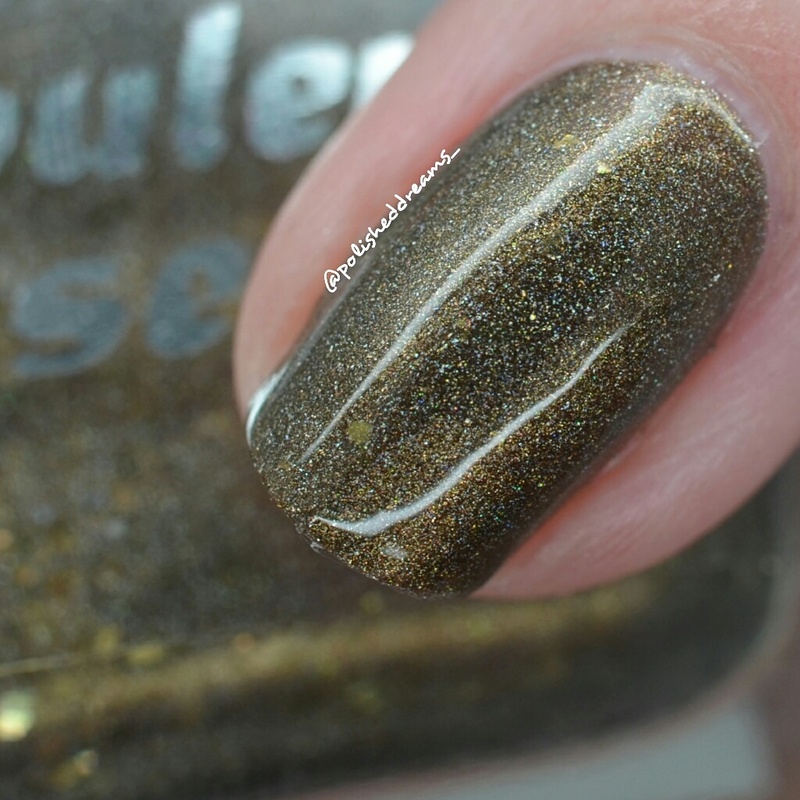 Of course it also contains holo and some beautiful gold flakes. Like most people who have swatched this, I wasn't too sure on it in the bottle but once I got it on my nails I was converted! It had a fab formula, super smooth and easy to apply which is always a great first impression when you try a new brand. Definitely going to try and use this again soon...maybe with some gold stamping? 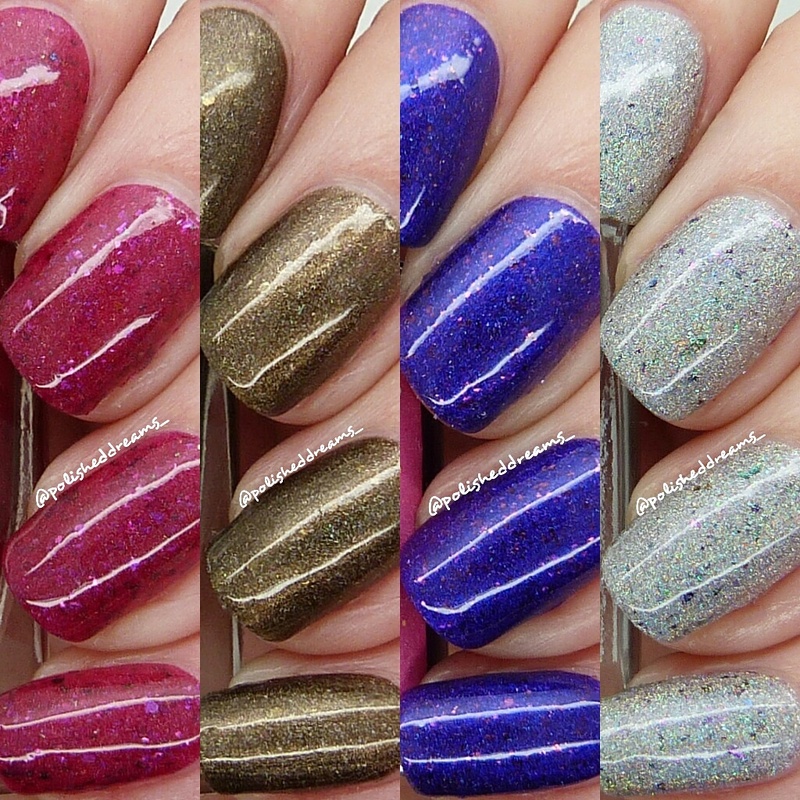 Swatch shows two coats with topcoat. The third polish is from the fabulous Freckles Polish. Julieann is actually closed at the moment (boooo!) but luckily for us, agreed to take part in the indie box. What's better is she has created yet another stunning purple polish!! 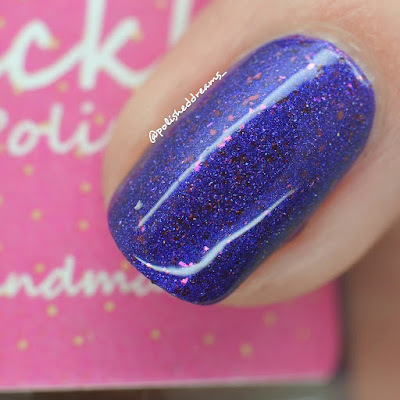 La La Land is a deep purple with holo (suprise suprise) and more flakies! Literally all my favourite things combined, what could be better? As usual, Julieann didn't disappoint and this is another one with a great formula. I know I praise most of the polishes I use but my favourite UK indies have got it all down to a T! Shown here is two coats with topcoat. 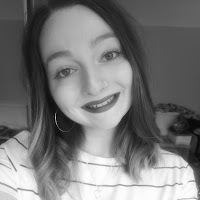 Last but certainly not least, we have the creator herself - Dame Danglefoot! The A list is an absolute stunner. 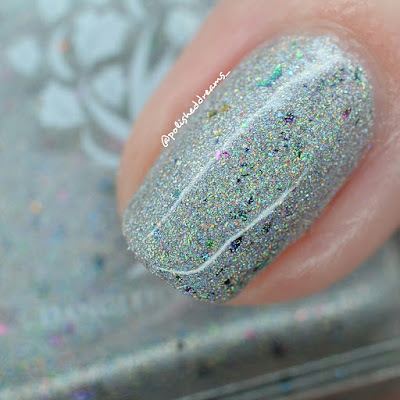 Made up of lots of holo and muti-chrome flakies you certainly couldn't get more Hollywood! I can't wait to get some proper sunshine so I can wear this out and about blind everyone. It was sparkly enough in my rubbish bedroom lights so I'm definitely going to need sunglasses when I take it into the big wide world. Despite the sparkly flakie contents this was also smooth and applied like a dream. I really do love my Danglies. Pictured is two coats with topcoat. So...what do we all think? I am super impressed! Almost tempted to say this is my favourite box so far but now I'm trying to think of what else we've had and failing slightly! I also find it funny that although the brief was that it had to be holo, all four wonderful ladies put flakies in and boy am I am glad. Every single polish is gorgeous and I'm so happy to be adding to my ever-growing collection. In regards to the eye shadow that also came in the box, I haven't tried it yet as I've been at work and having lazy days but hopefully I will soon. A big thank you to Ashleigh, Sharon, Julieann and Hayley for creating these beauties. You've made a girl very very very happy! Love the colours (apart from the second, I feel that's an acquired taste, well for me at least). You swatched them beautifully and I also agree that Cindy never fares well!